I went back through all 2010 sales in the Forum that published an asking price and included photos showing the whole kitchen, for an exhaustive comparative survey of premium cabinet sales. I defined “premium” sets as complete sets in excellent condition and with one or more exceptional qualities such as: a rare brand, unusually large set, in color, with custom details or specialty cabinets. Results: Of the 29 full sets I compared, the price range was between $9 – $83 per cabinet. The average per cabinet asking price came to $39. Turquoise was the most common color last year (excluding white), with ten sets, followed by 6 yellow ones. 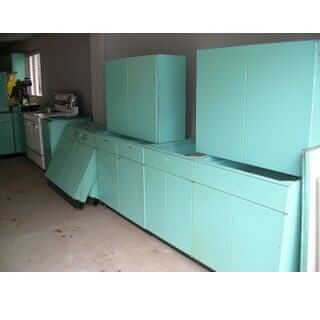 Turquoise pricing ranged from $9 – $60, with the average turquoise cabinet price @ $33. I dropped out the highest cabinet sale — which was a yellow St. Charles set for $116/cab, and the lowest sale, of which there were at least three full free sets of cabinets (Homart, pink/white GE, and wood front St. Charles). Cabinet count: Some kitchens included in the sale appliances, drainboards, special countertops and very rare items. I counted each non-cabinet item as an extra cabinet or sometimes two. Glass front “undercabinettes” are worth two cabs. An oven, fridge, or drainboard is 2 cabinets, a range plus hood counts as one (except for a few rare integrated large stoves, worth more). 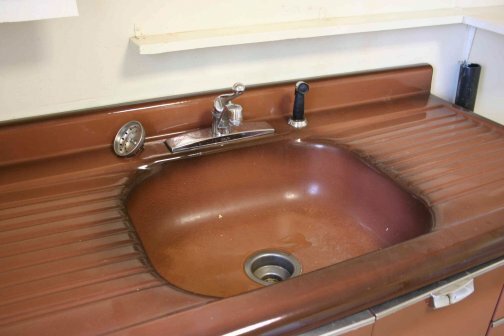 Consequently, those items were undervalued rather in the extreme, as a vintage Elkay double drainboard, for example, could easily sell for $300-1500. As calculated in the kitchen it was sold in, it’s only “worth” $60. I didn’t include eBay sales in the survey. The market is largely local and only a handful of cabinet sets are sold there, since shipping is cost prohibitive. I only remember a few sets actually closing last year, for very low amounts ($300 range). I used the final asking price on the ad, many which were reduced several times over weeks or months. Again this errs on the conservative side, as most Craigslist deals settle for less than asking price. There may be a few sets however (the Elkay sink set for example), that could have fetched more. Geography was not taken into account, as a quick look at Dwell, Apt. Therapy, Atomic Ranch, Modern Phoenix, Pam’s blog & forum, or any of the dozens of mid mod blogs and publications prove that the demand for midcentury is nationwide. 52PostnBeam says that she believes the #1 reason for prices not rising, is that, “Tthe economies of all home-related industries and actions run parallel with the housing market. As 2010 saw the bottom of the market, it makes sense that it was the year cabinet sales fell the most dramatically. Those lines of credit are a thing of the past. Also – when people are worried about being able to sell their house in a tough market, they make conservative choices, not artsy, custom antique kitchen choices.” Yup, I think she’s right. Many if not most vintage metal cabinets require repainting. This is a hassle and can be expensive, even more so if there is rust, which there often is. You have to find someone to do it who has the patience and consideration required. Beware: Hot baking ovens can warp doors. Things can go wrong. *And remember to test for lead paint. Unless you are installing a galley kitchen in a loft, you are going to have to fit someone else’s kitchen into your existing space – a huge issue. 52PBnJ has one complete set, a 20 pc Republic Steel that she was able to buy 100 miles away; but, she has continued to acquire other necessary pieces from Tucson, two separate cities in Michigan, Cincinnati, Denver, and Los Angeles. All this, to parse together one kitchen that works, and I believe she is *almost* but *not quite* satisfied with her collection to date. I also recall that Scathing Jane, another reader who in previous years was a Reader of the Year for her Forum contributions, also had to collect three sets of St. Charles cabinets to create one set that would work for her kitchen. You need to haul the cabinets — or pay shipping, which is not cheap for big hunks o’ steel. You need storage to hold everything until you have the set you need. Your search has to come together in synch with your desire to start or end your kitchen renovation – timing is really a critical issue in making a deal work out. You have to have the time, patience and true drive to do this. You have to be a fanatic to do this. See all of the above. Bottom line: Time is money. If you are a seller, please realize that you are not just selling “cabinets”, you are a selling “a humongous project.” If you are a buyer, please realize, the outcome can be fantastic – amazing – but it is A LOT of work. A lot a lot. The steel kitchen cabinet buy/sell forum. Registration required. Sorry, spammer hell if I don’t do it. My post: How much are my steel kitchen cabinets worth? 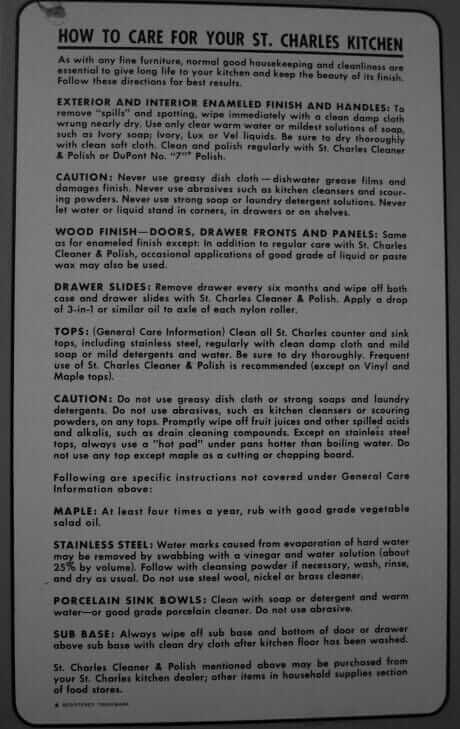 My post: How and where to sell your vintage steel kitchen cabinets. My post: How to make someone else’s vintage cabinets fit into your kitchen. All of my Steel Kitchen Cabinet stories. I am looking for a large set of Youngstown metal kitchen cabinets, I would like to find something on the West Coast. Can anyone help? Watch craigslist like a hawk – see our story about searching craigslist (use our Search box to find the story). Good luck. I’m looking for a full set of kitchen cabinets please..Not to far from Cincinnati, OH. But I’m in IN. Thank you! See our category Kitchen Help / Steel Kitchens for tips. Your best friend: Craiglist… along with a tool like SearchTempest.